Observation - Id Please - Global. 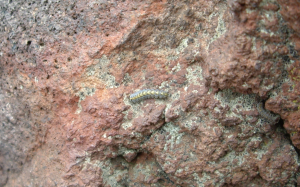 Description: While up at 1400m on the side of Mount Etna found this 'caterpillar' on bare rock scree. It was about 15mm long, any ideas? While up at 1400m on the side of Mount Etna found this 'caterpillar' on bare rock scree. It was about 15mm long, any ideas?